Would you like to learn how to trade a candlestick pattern that often yields very favorable risk to reward scenarios? Then trading the bearish harami candlestick pattern might just fit the bill. In this addition to my price action course, I’m going to teach you how to correctly identify and trade the bearish harami pattern. 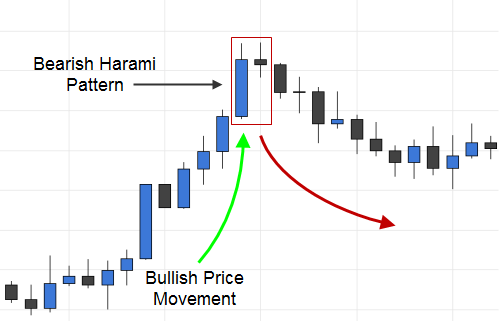 In one of my previous articles, Trading the Bullish Harami Candlestick Pattern, I showed you how to trade the bullish harami. The bearish harami is a similarly traded pattern, signaling market psychology that is likely to move price in the opposite direction. In this article, I’ll try to cover some new ground on trading these two great candlestick patterns. The bearish harami is a moderately strong bearish signal. This pattern, like the bullish harami, is not in the same strength category with such patterns as the hammer, morning star, engulfing pattern, etc. My preferred method is to trade candlestick signals in addition to my favorite trading system. Keeping in mind that the harami signals are only moderately strong, I think it is especially important to consider other technical indicators that may or may not support trading any particular harami pattern. Note: I do not recommend pure price action trading with these signals, although some traders are very successful with this approach. 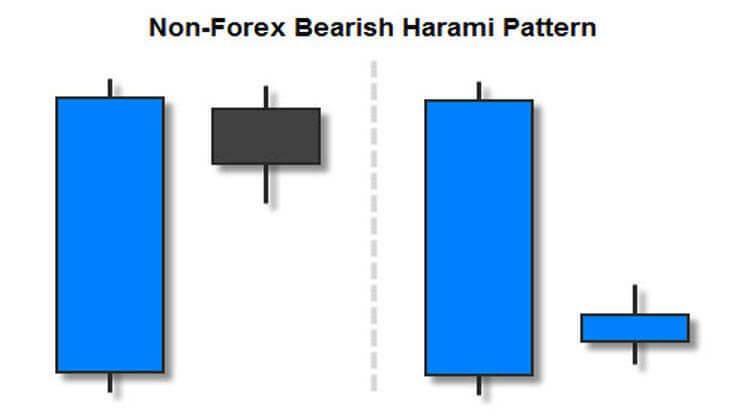 What is a Bearish Harami Candlestick Pattern? The traditional bearish harami candlestick pattern starts with a relatively large bullish candle, followed by a relatively small candlestick that can be bearish or bullish, with a real body that can open and close anywhere within the range of the previous bullish candle’s real body (see the image below). 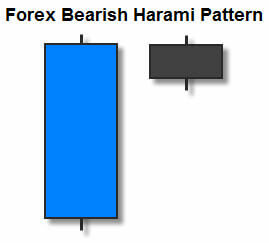 The only stipulation to a traditional harami pattern is that the second candlestick must not be more than 25% of the preceding candlestick (see the image above). Again, whether or not the second candlestick is bearish or bullish, or where the second candlestick opens and closes (in relation to the preceding candlestick), is of little significance in most markets. This pattern may look slightly different in the Forex market. In the Forex market, the second candlestick will, almost always, open near the close of the first candlestick. The second candlestick must also always be a bearish candlestick (see the image on the right). Obviously, another bullish candlestick would prevent the crucial inside bar of this pattern from developing. Finally, I must mention that a true bearish harami candlestick pattern can only develop after an uptrend in price. The context in which you trade these, or any, price action signals is crucially important. Note: Never trade the harami patterns, or any price action signal, from an area of price consolidation (flat or sideways markets). 1. This pattern shows that, although price action signals (when used correctly) have a high probability of indicating the immediate direction of the next price movement, there is never any guarantee on how long this movement with last. You must be prepared to take profits early in some cases. This is true for all price action patterns. 2. Although the bearish price movement was short-lived, in this case, you could have still made a nice profit on this trade due to the high risk to reward ratios that the harami patterns typically offer. This is because your entry point would have been 1 pip below the bottom wick of the smaller, second candle of the pattern. Even though the dip in price in the example above was short-lived, you still could have made, at least, twice what you would have risked on that trade. Imagine the kind of risk to reward scenarios you could achieve when the bearish harami pattern is followed by a full reversal with some conviction. It’s not uncommon to achieve 5 times your risk when these trades work out nicely. The downside to this candlestick pattern is that it is only a moderately strong reversal signal. As I mentioned earlier, it is not to be treated in the same respect as a strong reversal signal, such as a hammer, morning star, engulfing pattern, etc. In fact, some traders, including Steve Nison, trade this pattern as they would trade a doji. Don’t give up on the harami patterns just yet, though. The favorable risk to reward scenarios can make up for many losses. Even small corrections in price (like in the example above) can make up for 2 or more losses. Of course combining these harami signals, or any price action pattern, with a good trading system will help to qualify the best trades to take. At the very least, you can use these signals as an indicator of when to take profits on trades that you are already in. Example: You are in a bullish trade, riding the price action steeply upward (as in the example above). Next, you see the bearish harami develop. As this is a bearish indicator, you would use this signal as a place to either close or partially close your trade. I included the example above because the context in which you take any price action signal is the first and most important thing to consider. 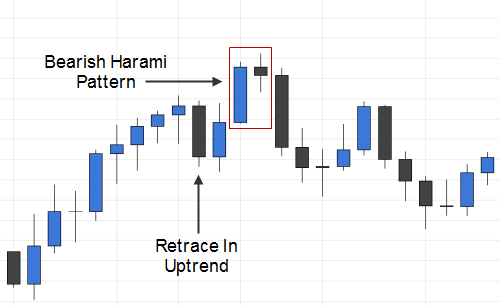 Earlier, I mentioned that a true bearish harami candlestick pattern only occurs after an uptrend in price. The example above shows an uptrend with a small retracement in price that occurs before our candlestick signal. This small retracement may have led a less experienced trader to disqualify the harami pattern that occurred afterward. However, this is still an example of an uptrend until after our pattern. I wouldn’t consider any downward movement during an uptrend to be more than a retracement unless it consists of 3 or 4 strong bearish candlesticks (or perhaps 2 very large candlesticks) or a series of lower highs and lower lows (which occurred after our pattern). The bearish harami candlestick pattern pictured above is an example of this particular candlestick signal that would have worked out very well. You could have made twice what you were risking on this trade before the first candlestick closed. Obviously, the trend continued downward from there. The trigger to jump into a properly qualified bearish harami is when price breaks (1 pip) below the low of the smaller, second candlestick in the pattern (see the image above). 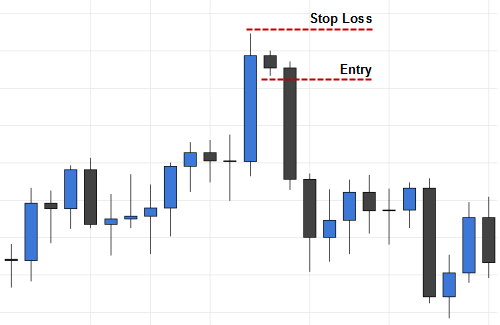 You would place your stop loss (1 pip) above the highest high in the series of candlesticks that formed your harami pattern (see the image above). Note: If another candlestick pattern or other relevant resistance level is slightly above your candlestick pattern, always place your stop loss (1 pip) above the higher resistance level. In the example above, the first candlestick in the pattern made the highest high, and there were no other relevant resistance levels nearby, so this rule did not come into play. Another thing to note is the size of the first candlestick of the pattern in relation to the other nearby candlesticks. In the example above, the first candlestick is much larger than the previous 12 candlesticks pictured. Psychologically, this gives more relevance to the pattern. It signifies that, even after a confident rally by the bulls, the overall market is not quit sure that upward price movement is the right direction at this time. All candlestick patterns are great short term signals, but there is never a guarantee that the new direction of price will follow through with any conviction. Sometimes candlestick patterns signal small retracements in price. The harami patterns excel in these situations, because of the favorable risk to reward scenarios that they typically present. Remember that a true bearish harami only occurs after an uptrend in price. The stronger the uptrend, the more relevant the signal in most cases. Never trade any candlestick patterns during periods of price consolidations (sideways markets). Choosing only the best entries and using wise money management skills will go a long way to preserve your capital and ensure your continued success while trading these candlestick signals. As always, be sure to demo trade these signals until you are consistently profitable before risking your hard earned money. Steve Nison recommends combining Japanese candlestick trading with western technical indicators to qualify the best trades. I personally use Nison’s candlestick techniques in combination with another profitable trading system, which has worked out well for me. The bearish harami candlestick pattern is often overlooked by price action traders, because it’s only a moderately strong signal. However, the favorable risk to reward scenarios that harami signals present should encourage you to pursue and master them. Have fun learning and happy trading! It makes me happy to hear that! I’m glad I could help you. Hello again, osusu. Thanks for the compliment and thanks for reading. If you like these articles, please share them. I would really appreciate it. When qualifying this candlestick pattern, the wick is not very important, although a long outside wick could create a poor risk to reward scenario. The opening and closing (real body) of the small candlestick must be inside the real body of the previous candlestick. The real body of the tall candlestick should be 4X larger than the real body of the small candlestick. Those two things are all you need to qualify this signal. I feel like I should mention that I don’t personally trade the harami patterns anymore, although I have in the past. They aren’t strong patterns. If you’re going to do it, you should combine it with a good trading system or, at least, other strong trading techniques – like MACD divergence. Also, I would shoot for a 3:1 reward to risk ratio too. I mentioned that in one of my recent articles. The idea is that the small amount of pips that is typically at risk would make a 3:1 ratio more likely to be hit on a regular enough basis, and the increased profit on wins could help to offset the lower strike rate (because of the weakness of the signal). I’ve only tested this idea a bit, but not enough to say that it works for sure. However, if I were going to trade the harami patterns today, that’s what I would start testing first. I would have stop trading but your articles made me to stay back, on your daily engulfing candle 50% entry, will I cancel the order if it did not trigger on the next candle or how many candles will it take to trigger? I’m glad I could help you, osusu. Don’t give up. It’s worth it to learn how to make consistent profits from the market. Just focus on becoming an expert at one technique at a time. You’d be surprised what you can do in 5 years – even if you start with a small account and only average 2-3% per month. With the 50% entry and the confirmation entry, you don’t want to wait forever for a pullback. The longer you wait, the less likely it is that you were right about the signal. I typically don’t wait more than 5 candlesticks after the confirmation candle. Less than 5 if the confirmation doesn’t happen right after the signal candle.